Ed. 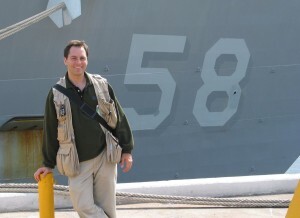 note: This story originally appeared on Brad Peniston’s web site, navybook.com. Just north of Kingsessing’s 49th Street bridge, amid the brush and litter of the Amtrak right-of-way, an old railroad monument offers an express ticket back to the Age of Jackson. In 1838, the Philadelphia, Wilmington, and Baltimore Railroad completed the first rail line between its namesake cities, a landmark feat that also helped link Boston and New York to the nation’s capital. 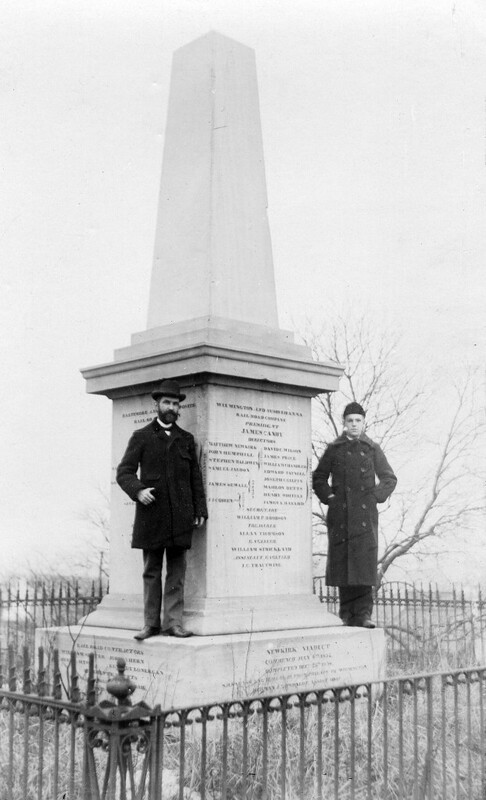 The following year, the railroad’s board commemorated the effort with a 15-foot marble obelisk at the western foot of its Schuylkill River bridge. Inscribed on this Newkirk Monument were the names of the four railroads that merged to form the PW&B — and 51 of their executives, engineers, and contractors. 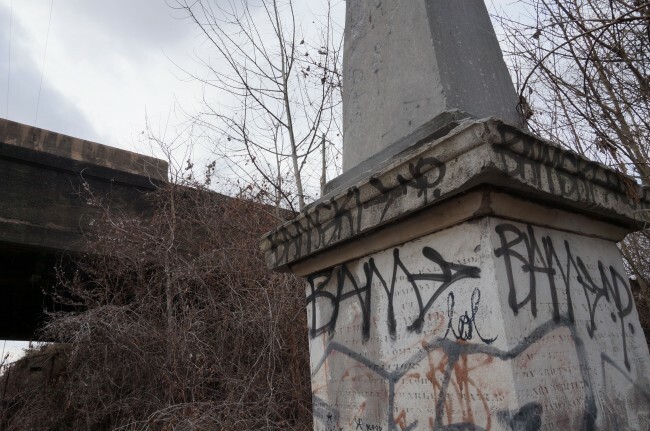 Last year, we traced the monument’s forgotten journey, and proposed its return to the planned Bartram’s Mile section of the Schuylkill River Trail. But what of the people memorialized on it? Like the weather-worn obelisk itself, these railroad builders have largely passed into undue obscurity. Their busy lives reflected the young America of their day: an energetic, expansionist country midway between the War of 1812 — the definitive victory over its erstwhile colonial master — and the Civil War, the cataclysm born of Constitutional sin. The complex endeavors of industry were beginning to reshape an economy of subsistence and trade. Less than a decade had passed since rickety trains first carried American passengers and general freight, yet railroads were already supplanting canals as the greatest peacetime consumers of capital, labor, and organization. Some named on the Monument were immigrants, others the scions of families long established on American shores. All were white men; most were well off, if not wealthy. Some could be fairly judged heroes, others knaves. Their ranks included a pioneer of U.S. railroad construction, one of Philadelphia’s largest landlords, and one of Maryland’s first Jewish elected officials. Their stories, which intertwine in unexpected ways, offer a rare glimpse into formative patterns of American life, business, and power. Vice President: Jacob J. Cohen Jr.
Directors: Philadelphia: Matthew Newkirk, John Hemphill, John Connell, William D. Lewis. Wilmington: James Canby, James Price, David C. Wilson, James A. Bayard, William Chandler. Baltimore: Jacob J. Cohen Jr., Charles F. Mayer, John McKim Jr., James Swan, William A. Patterson. Delaware: Thomas Smith. Directors: Philadelphia: Matthew Newkirk, John Hemphill, Stephen Baldwin, Samuel Jaudon. Elkton: James Sewall. Baltimore: Jacob J. Cohen Jr. Wilmington: David C. Wilson, James Price, William Chandler, Edward Tatnall, Joseph C. Gilpin, Mahlon Betts, Henry Whitely, James A. Bayard. Directors: Philadelphia: Matthew Newkirk. New York: Roswell L. Colt. Maryland: Charles F. Mayer, Jacob J. Cohen Jr., John B. Howell, C.W. Karthouse, Frederick Dawson, Henry Thomson, John C. Morton. Directors: Wilmington: James Canby, James Price, Edward Tatnall, Henry Whitely, William Chandler, David C. Wilson, Mahlon Betts. Elkton: James Sewall, Joshua Richardson, Greenbury Purnell. Commenced July 4, 1837. Completed December 25, 1838. In all, there are 80 names on the monument, but some are repeated because of their roles in multiple railroads. Of the 51 individuals memorialized in stone (their names appear below in bold), none is today a household name. Perhaps William Strickland (1788-1854) comes closest. As a youngster, the New Jersey-born Strickland apprenticed under Benjamin Latrobe, generally considered America’s first professional architect. But Strickland left Latrobe’s Philadelphia office (some speculate he was fired), and turned to surveying, painting, and other jobs. His skill at organizing fortifications during the War of 1812 drew him public esteem, and he soon afterward won his first architectural commission. Strickland went on to design many, if not most, of Philadelphia’s Greek- and Gothic-Revival landmarks: the Second Bank of the United States, the Merchants Exchange, the Naval Home, the National Mechanics Bank (now Bar & Restaurant), and many more. Strickland poured his accumulated expertise into a technical report that became the wellspring of American railroad engineering. A cautious editor excised his bold prediction that railroads would one day eclipse canals, but his foresight was quickly borne out. In the early 1830s, the state legislatures of Delaware, Maryland, and Pennsylvania chartered companies to connect their states by rail. Two of the nascent railroads hired Strickland as chief engineer: the Delaware & Maryland (D&M) and the Wilmington & Susquehanna (W&S). Strickland’s assistant on the W&S was John C. Trautwine (1810-1883), who would later publish The Civil Engineer’s Pocket Book, an early professional handbook that remained the field’s standard work into the 20th century. His assistant on the D&M was James P. Stabler (1796–1840), a former postmaster in Sandy Spring, Maryland, who was eventually laid off and went home to grow silkworms. Yet another student was Samuel H. Kneass (1806-1858). He was a son of William Kneass, the U.S. Mint’s chief engraver and an old friend of Strickland’s. The younger Kneass served as Strickland’s assistant during his seminal travels in England, and in 1837 was hired to build the PW&B’s Philly-to-Wilmington stretch. Kneass entwined himself even more intimately with the railroad when he married the daughter of PW&B superintendent Charles Lombaert (1790-1875). Soon afterward, the railroad promoted Charles’ son Herman J. Lombaert (1816-1885) to assistant engineer, turning Kneass into his brother-in-law’s boss. Rounding out the engineering chiefs of the four railroads was Latrobe’s own son, Benjamin Latrobe II (1806-1878). The Baltimore & Port Deposite Railroad (B&PD) hired the younger Latrobe away from the Baltimore & Ohio Railroad, for which he designed the 1835 Thomas Viaduct (still in use today!). The Monument bears the name of PW&B president Matthew Newkirk (1794-1869), a dry-goods merchant whose subsequent success in banking, real estate, mining, smelting, and railroads made him one of the wealthiest men of his day. The eighth of nine children born to a New Jersey farm family of Dutch descent, young Matthew apprenticed himself at age 16 to a Philadelphia merchant on Front Street. After serving as a corporal in the War of 1812, he — in partnership with his sister Mary — opened his own store a few blocks away. 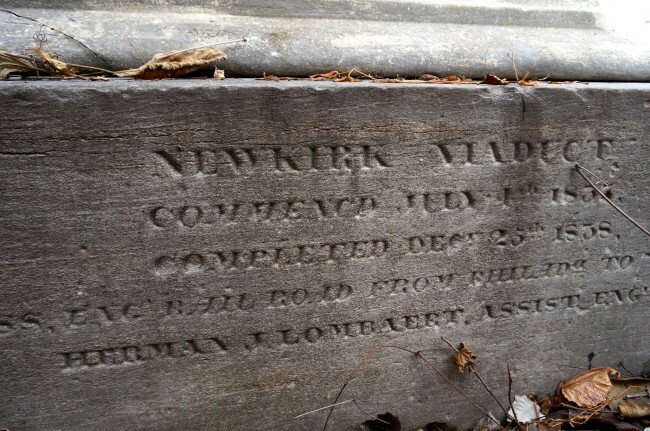 The business thrived, as did subsequent ones that extended his trade as far as New Orleans, and presently Newkirk had time and money to expend on other pursuits. His real estate investments spanned 11 states and a good share of Philadelphia’s rental housing stock. He sat on the board of the new Girard College; he contributed land and enthusiasm to the new Fairmount Park. A devoted Presbyterian who attended services thrice weekly, he promoted total abstinence from strong drink; in 1833, he helped lead the first national temperance meeting. The entire line between Baltimore and Philadelphia was built under the charters of four different companies, and no little skill was required on his part to harmonize their action. The one next to Baltimore, with which I was connected, gave him no trouble in that respect, for he furnished every dollar of the capital which it cost, and his word was consequently law here. The section of the route between the Susquehanna and Wilmington was more difficult to manage, as the Wilmington people had contributed largely to its construction from their more immediate interest in it, and there were some opinionated persons among the directory at that place. Among those who rendered this assistance was Samuel Jaudon (1796-1874), a longtime agent of the Bank who also served as a director of the PW&B and W&S. After the Bank collapsed in 1841, Jaudon and Biddle were indicted on charges of defrauding its shareholders. Later, Jaudon sold his sister-in-law’s inheritance in a fruitless attempt to cover his own losses in coal speculation. PW&B director William D. Lewis, who helped launch the career of Philadelphia titan Matthias Baldwin by hiring him to assemble a locomotive for the New Castle & Frenchtown Railroad in 1832. PW&B secretary James Wilson Wallace (1811-1862), a lawyer — and Newkirk’s nephew. PW&B assistant treasurer Aubrey H. Smith (1814-1891), a Penn graduate and U.S. attorney general who wrote the first study of invasive plant species in Philadelphia rivers. Alexander Provest, chief stonemason for the PW&B’s 1838 Schuylkill bridge. A native of Germantown, Provest later moved to Washington, D.C., where he was hired by Thomas Ustick Walter to supply the stone to enlarge the Capitol and build its dome. And just who were Latrobe’s opinionated Wilmingtonians? By and large, they were the scions, sons-in-law, and associates of grain millers who manufactured wealth from the Brandywine River’s tumble across the Atlantic fall line. The president of the W&S was James Canby (1781-1858), a third-generation miller who extended his family’s efforts to banking, business, and real estate. Among his fellow directors — and partners in several other business endeavors — were Edward Tatnall (1782–1856), son of a Brandywine miller and uncle of a future governor of Delaware; and James Price (1776-1840), a banker who invested in the Tatnall mills and married Edward’s sister. In 1784, two friends emigrated to Baltimore from the German duchy of Württemberg. Christian Mayer, wealthy by inheritance, arrived to establish the American arm of a Dutch trading house, while Lewis Brantz (ca. 1768-1838) came to seek his own fortune. Within a year, Brantz was leading a group of German settlers to the interior via Pittsburgh, where they bought boats and headed downriver to the Tennessee outpost today known as Nashville. (He repeated the journey a few years later, pausing to daub the earliest known painting of Pittsburgh.) Mayer and Brantz eventually established their own merchant company in Baltimore, selling books to the likes of Thomas Jefferson and dispatching ships profitably to the East Indies and beyond. Brantz himself captained voyages to Europe, South America, and China. In 1835, Brantz became president of the B&PD. (He replaced fellow shipping magnate Roswell L. Colt (1779-1856), a cousin of gunmaker Samuel Colt.) Among the railroad’s directors was Mayer’s eldest son, Charles F. Mayer (1795-1864), who had distinguished himself as a lawyer, state legislator, and leading light of the city’s intellectual life. When Brantz died suddenly in 1838, the railroad’s presidency passed to Jacob J. Cohen Jr. (1789-1869). Son of a Jewish emigré from Bavaria, Cohen helped defend Baltimore during the War of 1812, then opened a private lottery office with his brothers. (A common fundraising method of the day, lotteries were used to underwrite everything from public works to universities to churches.) The business thrived, expanded to several East Coast cities, and made Cohen rich enough to build Baltimore’s first house lit by gas. Endeavors in banking and insurance expanded his fortune, and Cohen spent generously to support Baltimore’s synagogues. He also led an early civil-rights fight to change the Maryland law that barred non-Christians from public office. After the “Jew Bill” passed in 1825, Cohen won election to the city council, becoming one of the state’s first Jewish officeholders. Our brief journey is coming to an end, but we may pause to note that Newkirk, Strickland, and Cohen were hardly the only Monument men who helped turn back the British in the War of 1812. Lawyer Samuel Edwards (1785-1850), a future PW&B solicitor, bought arms and equipment for a company of soldiers from Chester, Pa. In 1813, the men were dispatched south to Frenchtown, Md., where they were overcome by a British force driving upriver from the Chesapeake Bay. The invaders sacked the town and continued on to Elkton, where they were finally stopped by a battalion commanded by Maj. James Sewall (1778-1842), a future PW&B director. Some of the names on the Monument remain obscure. (Does anyone know anything about Uziel H. French, the Viaduct’s bridge carpenter?) But even this quick and incomplete journey back to the 1830s should be proof enough that the Newkirk Monument is worth saving. 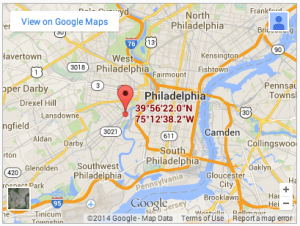 Let’s move it to the new Schuylkill River Trail segment, scrub the graffiti off, and return it to the public eye. 1. Wilson’s transcript misspells these names: John Connell (last name given as “Connel”), Henry Hazlehurst (“Hazelhurst”), Alexander and Charles Provest (“Provost”), Aubrey Smith (“Aubry”) and finally, Edward Tatnall (“Tatnell”), a mistake that also appears on the monument. On the other hand, the spelling of Port Deposite accurately reflected contemporary use. 2. Comparisons across 17 decades are far from exact, but $4 million in 1838 would be at least $82 million today. 3. Another son was Strickland Kneass, who surveyed Pennsylvania’s boundaries, laid out the PRR’s Horseshoe Curve in Altoona, and succeeded Samuel as Philadelphia’s chief municipal engineer. Great article! Every day I pass this monument on the train and wonder about its history. Hopefully, one day it can be relocated to a prominent location. Thanks so much for this article! For 2.5 years I’ve passed this monument on Septa every weekday without a single bit of luck trying to figure out what it was, or what it said. The deterioration of the carving and the awful graffiti make it absolutely impossible to make out.